Today, is the birthday of Dr. Martin Luther King Jr and we can celebrate a man, who achieved so much in the way of the Civil Rights movement, brought together people of different races, creeds and religions and led a non-violent fight to obtain rights for our parents, grandparents and great grand parents. If you are not aware about the civil rights era and Dr. King's involvement go here for more. 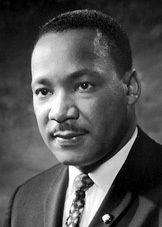 Thank you Dr. King for your contribution to the well being of society.